Solar lights can be useful for so much more than lining your driveway. 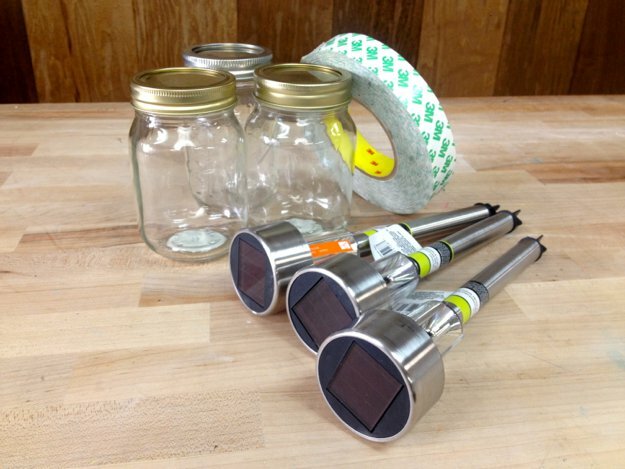 Whether you need outdoor mood lighting or handy lanterns for power outages, you can create easy solar lamps from mason jars and cheap solar lights. This is an inexpensive and easy way to add charm to any outdoor space, or create a backup plan for when your trusty flashlight burns out. Start by removing the stake part of the light. It should just slide right off. You’ll be left with the solar panel and light component. We kept the plastic casing around the LED. Remove the stake piece of the solar lights so you are left with the top solar panel piece. We kept the plastic casing around the light because it has a metal reflector that helps intensify the brightness of the lamp. Grab the jar and unscrew the lid. Remove the flat part of the lid and just keep the ring. The top part of the solar light should slide through the ring nicely with a little bit of snugness. In order to make sure the light doesn’t fall down into the jar, you’ll need to put the foam tape around the top of the light. This will keep it snug. Remove the lid from your jar. Wrap the foam tape around the solar light. Once you’ve put a single layer of tape around the light, slide the light back into the ring until the top of the solar panel is flush with the top of the lid. Squeeze the light into the center of the lid so it’s mostly flush with the top of the jar. Screw the lid onto the jar and enjoy your new solar light! Your first solar light is complete! it seems a lot of them might write a few sentences then try to sell something. I realize everyone needs to make money, at least you are giving something of value first. Look forward to more issues.